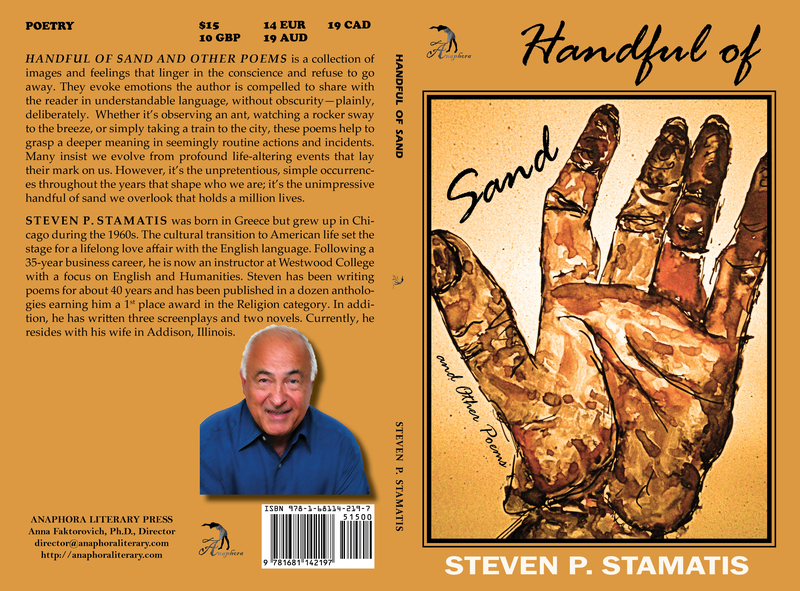 Handful of Sand and Other Poems: ($15, 92pp, 6X9″, Print ISBN: 978-1-68114-219-7, EBook ISBN: 978-1-68114-220-3, LCCN: 2015916951, October 2015; Purchase on Amazon or Barnes & Noble): is a collection of images and feelings that linger in the conscience and refuse to go away. They evoke emotions the author is compelled to share with the reader in understandable language, without obscurity—plainly, deliberately. Whether it’s observing an ant, watching a rocker sway to the breeze, or simply taking a train to the city, these poems help to grasp a deeper meaning in seemingly routine actions and incidents. Many insist we evolve from profound life-altering events that lay their mark on us. However, it’s the unpretentious, simple occurrences throughout the years that shape who we are; it’s the unimpressive handful of sand we overlook that holds a million lives. Steven P. Stamatis was born in Greece but grew up in Chicago during the 1960s. The cultural transition to American life set the stage for a lifelong love affair with the English language. Following a 35-year business career, he is now an instructor at Westwood College with a focus on English and Humanities. Steven has been writing poems for about 40 years and has been published in a dozen anthologies earning him a 1st place award in the Religion category. In addition, he has written three screenplays and two novels. Currently, he resides with his wife in Addison, Illinois.